Don’t let sprawling stems spoil your pretty perennial display. A little well-timed trimming easily prevents the problem. 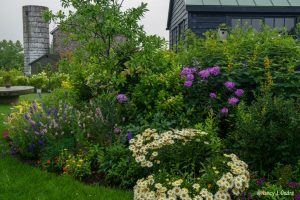 Proper pruning can make a drastic difference in the appearance of many summer- and fall-flowering perennials, turning what could be messy-looking masses into dense, flower-filled clumps. If you’d like to enjoy your beds and borders without dealing with staking now or sprawling stems later, this is a good time to think about doing a bit of selective perennial pruning. Frequent, light trimming—removing 1 to 2 inches from each shoot tip every few weeks starting in mid- to late spring—produces the bushiest plants. Just keep in mind that you’re removing developing flower buds too, so give early to midsummer bloomers (such as catmints, coreopsis, and garden phlox) only one or two trims before stopping to let them flower. A spring trim keeps your catmints (Nepeta) bushy and less likely to sprawl when in full flower. 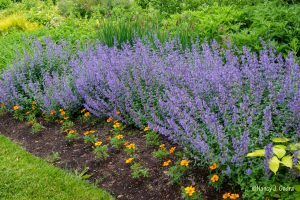 On later-summer and fall-blooming perennials, such as chrysanthemums, balloon flower (Platycodon grandiflorus), sneezeweeds (Helenium), and upright sedums, you could continue the light trimming through midsummer, stopping by the end of July so they have time to flower before frost. 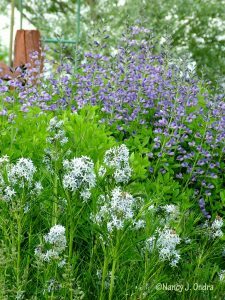 Or, simplify the process on tall perennials by pruning whole clumps just once or twice, shearing them back by about half their height. Doing that in early summer will reduce the plants’ ultimate height by a foot or two without changing the bloom time much. Waiting until midsummer (early to mid-July) will reduce their final height a bit less but delay the flowering period by several weeks: a big plus if you’d like to have a spectacular show in early to mid-fall instead of late summer on tall asters, boltonia, ironweeds (Vernonia), and ‘Henry Eilers’ sweet coneflower (Rudbeckia subtomentosa). Be aware that this sort of cutting-back doesn’t work for daylilies (Hemerocallis), true lilies (Lilium), torch lilies (Kniphofia), and other perennials with non-branching stems. On a large clump of a tall perennial, such as ‘Lemon Queen’ perennial sunflower (Helianthus), consider pruning just the front half. The taller, uncut part will flower first, followed by the shorter, pruned part a couple weeks later, greatly extending the show of color. The shorter front part will also help to hold up the taller stems in the back. While you’re out pruning later-flowering perennials, keep in mind that some early bloomers, such as lungworts (Pulmonaria), comfreys (Symphytum), and columbines (Aquilegia), benefit from being cut close to the base after flowering. This promotes a flush of fresh new leaves for interest in late summer and fall and prevents the plants from producing unwanted seedlings as well. 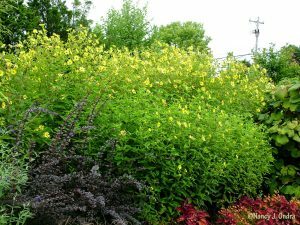 Post-bloom pruning—cutting back by about half—also works wonders for keeping false indigos (Baptisia) and bushy bluestars (Amsonia) in good shape, preventing later sprawling and self-sowing too.